One of the first things you may notice when traveling to Okinawa is how different the construction of traditional houses is from that in other parts of Japan. The red terra cotta roof tiles are particularly conspicuous. While the people of Okinawa today take pride in these red roof tiles, known as akagawara (赤瓦), the tiles were once considered embarrassingly provincial and deliberately painted black or gray in order to more closely resemble those found in other parts of Japan and Korea. In the 18th century, as construction of buildings and houses accelerated in the Ryûkyûs, the red tiles made from locally mined clay called kucha were produced in order to save time and money. These were then painted over. An example of the gray tiles can be found here. 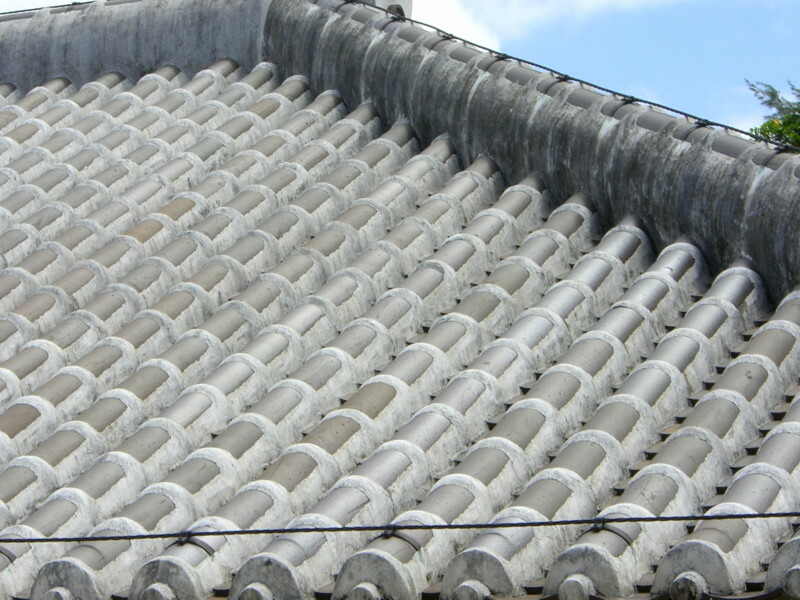 Another distinctive feature of the Okinawan roof is the copious amount of cement or mortar used to fix the tiles in place. Because the islands deal with typhoons on a regular basis, the roofs have been designed with these strong winds in mind. The roofs often feature the crest of the family, known as a kamon, at the base of the roof. In the photo above, you can see the chrysthanemum crest.